Low takes Germany to her lowest depth! 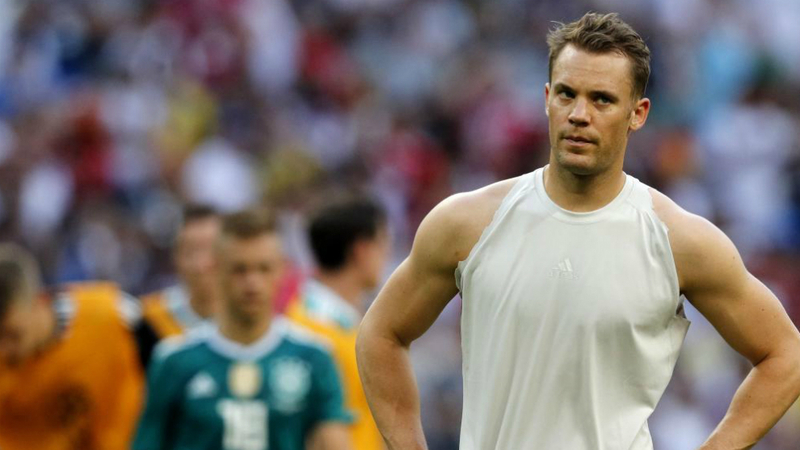 Goalkeeper Manuel Neuer of Germany. Germany may have won the 2014 World Cup, but they are heading home at the end of the group stages this time around after their national team’s biggest ever failure. A 1-0 loss to Mexico in their opener and a 2-0 defeat to South Korea on Wednesday afternoon means that they will be watching the rest of the tournament from home. Although they were able to pull off a dramatic late winner to beat Sweden 2-1 last Saturday, those three points aren’t enough. “Football is a simple game, as 22 men chase a ball for 90 minutes and, at the end, the Germans always win,” is the famous quote from Gary Lineker, but on Wednesday this wasn’t the case. As much as Joachim Low’s men huffed and puffed, they could not find a way past South Korean goalkeeper Hyun-Woo Jo, who made six saves. Timo Werner, Thomas Muller and Mario Gómez all came up short, with the Germans missing the World Cup decisiveness of the now-retired Miroslav Klose. Not since the 1938 World Cup have Germany crashed out in the group stages and back then they didn’t go into the tournament as one of the main favourites. This must be written into the history books as their biggest failure.